it is fantasic hotel and very much recommended for families and business taveller ,very suitable for business meeting and wedding cermonies ,hotel was built by 1723 a.c. and during the rule of shah sultan the last savafid king ,hotel has alluring court built in the style of iranian gardens ,with a quran house and nice traditional tea house RD12/06 fantastic look 3 storey building with a mosaic enterance situated in a very quite street . This is nice good budget hotel hotel ,very nice and attractive location,and got alot of features such and shops and barber shop,sauna,swiming pool ,tea garden and business center ,as well as good for busness as it has banquet facilities available.RD12/06 Nice modern building ,looking over the river ,with a small grandens places srounding the hotel. Top four-star Isfahan Aseman Hotel by the side of Zayandeh Rood is the highest building of Isfahan with 40 meters height and 13 floors is ready to receive the guests and travelers of Isfahan using its complete accommodation facilities. This hotel is founded in an area of 900 meters Isfahan Aseman Hotel has a five-minute distance with the city center and interesting touristic places and various facilities of the hotel will create pleasant accommodation for you. Part 3-star Hotel is located in the heart of Isfahan and in good location close to historical monuments of Isfahan such as Naqshe Jahan SQ and thirty-three bridges and with special accommodating facilities is ready to serve the honored guests. 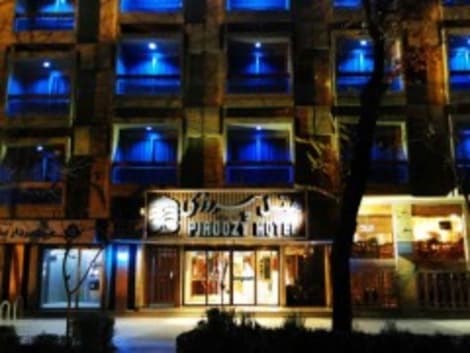 Amir Kabir 5-Star Hotel was established in July 2005, constructed in the hill of Arak heights, in Amir Kabir Tourism and Entertainment Complex, in a plot of land with area of 25 hectares, in a comfortable place, seeming in the form of a deck. Main building of this hotel includes 10,000 m2, in 7 floors with 75 rooms (single, double, triple beds, single and double bed suites. Amir Kabir Tourism and Entertainment Complex, enjoying good accommodation, reception and sport facilities of 5-star hotel in a memorial place, tries to present the services with upmost quality in order to fulfill the needs and expectations and increase the further satisfaction of guests and other beneficiaries. After an eventful day in one of Iran's most historical cities, the comfortably furnished rooms of the inviting city hotel offer peace and relaxation. Enjoy traditional cuisine and teas in the restaurant and in the tea house, and a real cup of mocha in the coffee shop. Parking is at your disposal. Sheikh Bahaei Hotel as a Top 3 star is conventionally allocated in the middle of the city, it is ideal for whatever you may plan. It is 40 minutes from the airport, and 5 minutes the historical monuments like Chahar Bagh School, Naghsh-e-Jahan square Aliqapu Palace and Imam Bazaar with easy access and close to shopping centers. Sheikh Bahaei Hotel has a prime location on the main street of the city, Chahar Bagh dtreet as the first and the most important street in Iran, Among what has remained from the age of the Safavids¿400 years ago¿ All of the rooms are furnished to the highest international standards of confort and luxury and facilities like daylight proof curtain, two layer glass, safe deposit box, satellite LCD TV, high quality bed's mattress,mini bar, telephone, air condition, Wi-Fi. Taxi service, laundry, room service 24h and parking. lastminute.com has a fantastic range of hotels in Isfahan, with everything from cheap hotels to luxurious five star accommodation available. We like to live up to our last minute name so remember you can book any one of our excellent Isfahan hotels up until midnight and stay the same night.